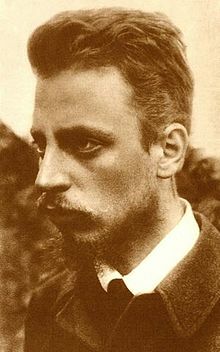 ***I’ve picked a few quotes from the 19th/20th century German poet, Rainer Maria Rilke, for this post. They are all taken from Letters To A Young Poet. The part of someone that is capable of giving and receiving love is somewhere beyond where we can reach it. It exists outside this world, yet connected to it. We can see its shadows. Phone calls, text messages, even spoken words and physical touch are all but shadows and traces of its action . . . they come from a place we cannot reach. And so, when we are separated from someone we care about, we are in essentially no different place than when they are close by. The essence, the soul, the spark at the core of a human being—this remains out of our reach no matter how near or how far they are from us. What, then, are we missing? What makes us feel so bad? We miss all of the little comforts, the moments of pleasure, the small distractions that another person can provide from the stress and problems of life. We miss the easy dance of their companionship. But the struggle to be together, to inch closer to the shining center of another human being, persists no matter whether the distance is measured in miles or inches. There is a trap here. Notice the word that “person” replaces: “thing.” This line of thinking objectifies the person you miss; it turns them into the keystone of your own happiness. And once they become the keystone of your happiness, you begin to lay burdens on them. You imagine them acting this way, at this time, doing this specific thing that will make you happy. Inevitably, when they return, they are not this magical keystone of happiness that you have built them up to be. The are a human being, not an object. It is too much to lay the responsibility of your own happiness on another. We avoid the trap by remembering that unhappiness is not something to be avoided. It is the raw material that feeds our soul; the ache of solitude is another layer of soil being laid in the bed of our heart, from which a rich and deep life continues to grow. We thank the rains for the harvest just as we thank the sun, but too much of either destroys the crop. A loved one may bring you sorrow, and may bring you joy. They will likely bring you both. Do not shun one for the other. A loved one’s absence is the opportunity to turn inward, to reconnect with the self, and to do the internal work that is necessary for the real journey toward the unreachable center of their being. It is a chance to build ourselves, to let go of fears and learn to be courageous. Learn to be fearless; it’s the way you can best serve your loved one while they’re gone.